Let’s face it, it has been established that we love DIY. It’s not just about being frugal, it’s just have so much more fun making or doing something for yourself. N’est-ce pas? There are a few things I do for skincare that I learned from good ole YouTube and now never forget to include in my regimen. 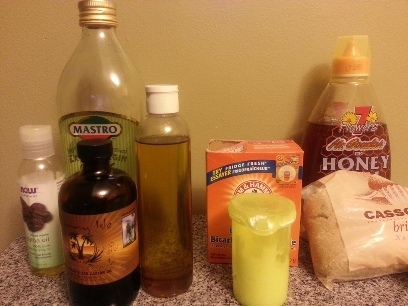 There will be another post similar to Ash’s Skin Care Regimen soon but here are some of the things I have made for my skin using products found around the kitchen. 1/2 Olive oil – it cleanses and moisturizes. Once a week, I massage the oil on my face and neck. I dampen a washcloth with hot tap water and place over my face for about a 15 secs to open the pores. Then I remove (squeeze) all blackheads from my nose area (yum), wash the cloth with hot water and then wipe the entire area. I then dampen the washcloth with cold water and place over my face for 15 secs to close the pores, then wipe the area. This makes my skin feel so refreshed whenever I do this! Even the next day, my skin is soft and my complexion is clear. You can use other oils like grapeseed oil since that’s great for sensitive skin, or almond oil since that also moisturizes. All these oils are also great moisturizers for haircare if you have dry hair/scalp. Quite frankly, the uses for many of these oils really deserve a separate post! And though I do have oily skin, this isn’t a concern since this method serves to really cleanse and refresh the skin. Simple! Mix honey and sugar (I use brown) making your own scrub (make sure there is enough sugar to make it really grainy), massage over your lips and let it sit there for a few seconds. Wash off with warm water and enjoy soft lips. Warning – you will be tempted to lick it all off. I do this at night and then apply some lip balm. Another great way to exfoliate your lips is using an extra toothbrush to rub your wet lips in a circular motion. I sometimes I do it right after I brush my teeth and there is still toothpaste on my mouth. Say goodbye to that annoying dead skin! Don’t forget to apply lip balm. For some of us these areas tend to be darker than we’d like. Mix some baking soda with water into a thick paste and rub on these areas before you shower. You’ll notice the skin is smoother and will slowly get a bit lighter with time (if you’re consistent). Once in a while I even use the paste on my the darker spots on my face (like my chin). This can also be used to exfoliate your lips. *Baking soda has several uses around the home from cleaning the tub to absorbing odors from your fridge, drain or compost bin. And there you have it, just a few DIY methods to take care of your skin. With all the various options available, it can be daunting and sometimes it just comes down to the simpler solutions that would achieve the same results. The oils can be found at any natural food store while other things like the baking soda, honey and sugar are of course at the grocery. I buy my baking soda at the neighbourhood dollar store to save a few pennies. Do you have any DIY skin care tips you’d like to share? Do you do any of these things listed above? What do you think? Sally Hansen Airbrush Legs – New and Improved Packaging! I am going to be trying your OCM very soon. I have to admit that even though I know thw science behind oily skin responding well to oil, the thought out treating my face with it still freaks me out a bit. As soon as I pick up some jojoba oil, I’m going in. I’ll let you know how it goes. Thanks for these great skin recipes! I can’t wait to hear your feedback on this… Guaranteed you’re going to l.o.v.e it! I love the your OCM and definitely want to try it! I don’t have too many beauty DIYs, but sometimes I make a body scrub with brown sugar and olive oil when my skin is super-dry and I need some serious moisturizing. Also, there’s nothing like coconut oil to keep hair lustrous and dark – but it is seriously oily, so a little goes a long way and only use it on evenings when you have nowhere to go and time to wash it all out! A heavy oil like coconut or olive is also great to keep feet and hands soft – rub on and wear socks/gloves to help it soak in. Even if you only apply the oil to cuticles and nails, hands and feet look so nice afterward. Much cheaper than brand-name cuticle oils! Thanks Seph, your suggestions are great! I totally agree about the coconut oil; I think every household needs a huge container of the virgin coconut oil. I use almost every night on my hair bc it’s so dry, and it helps keep it shiny and moisturized. Let me know what you think of the OCM! I have oily skin and have been using the OCM every night since December 2012 and my skin has never looked better! I use avocado and jojoba oil for now but I have used apricot kernel and grapeseed but I really like jojoba oil! Every few days I will exfoliate with either honey and some brown sugar (I use this on my lips too) or I’ll mask. I use products from the Sibu Line. I love coconut oil on my body but I agree with Seph it’s a heavier oil so you need to give it time to absorb! Thanks so much for your suggestions, Vann! You’re right about oils. And thank goodness because they are GREAT! I meant to say: You don’t need to SPEND a lot to get a lot! Woops! Lol! You’re right emjay, but I’d probably lick it off before I could do any damage. Thanks for commenting!